WASHINGTON, DC March 2014 –Suzhou and Portland, USA has jointly received a US-China Sister Cities Award in the “Economy and Trade” category. 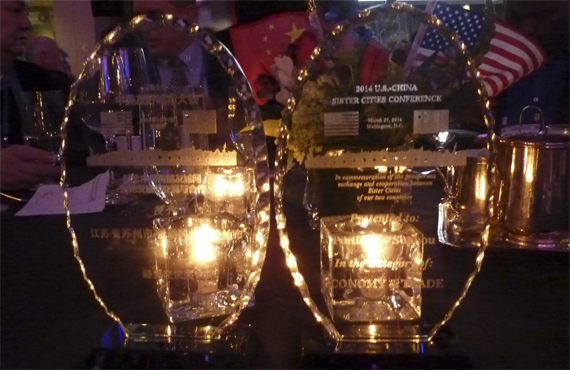 The two cities, along with other award winners, were honored at a special Awards Ceremony on March 27th the Sister Cities International US-China Conference in Washington DC. A delegation from both Portland and Suzhou were in attendance to accept the award. Representing Portland were Martha Pellegrino, Director of Government Affairs; Michael Gurton, Portland Development Commission; Cathy Chinn, PSSCA President; Robert Fraser, PSSCA Immediate Past President and Lynne McIntyre, PSSCA Past President. Representing Suzhou were Mr. Xu Ming, Vice Mayor; Mr. Xu Huadong, Director of Suzhou Foreign Affairs Office and Ms. Dorathy Lu, Suzhou Foreign Affairs Office. The awards granted by Sister Cities International, recognize the accomplishments of outstanding US-China sister city programs and their contribution in building strong people to people ties between the two countries. There are awards in several categories including Best Overall, Longest Relationship. Community Involvement, Youth, Arts and Culture, Economic Development and Trade, Most Innovative and Outstanding Individuals. Suzhou and Portland established sister cities in 1988. The two cities have cooperated in economy, culture, education and grassroots exchanges ever since. Companies from Portland have successfully expanded their companies in Suzhou. Among them is Nike, Inc. which opened a shoe manufacturing plant in Suzhou in 1996 and has based its largest distribution center in Suzhou’s county level city of Taicang in 2011. An art exhibit by Portland artist and PSSCA Board member Maihwa Frances Li has been created using acrylic to provide for a series of colorful paintings depicting memorable Oregon sights in all four seasons. While she traveled all over Oregon, Maihwa found much natural beauty, similar to Chinese landscapes, majestic mountains, cascading waterfalls, lush forests, scenic beaches, and abundant wildlife which inspired her for the creation of this exhibition. Maihwa Frances Li was born in Shanghai, China, and grew up in Taipei, Taiwan. She loves painting--all through her youth she took lessons from different masters to learn both traditional Chinese-style and Western-style paintings. In 1970, Maihwa came to the US to further her graduate studies at Ohio University in Athens, Ohio, met her husband Hehching Harry Li and married him in Rolla, Missouri in 1972. While raising two children in Upstate New York, Maihwa taught throughout the Upstate New York school districts, Chinese schools, and community colleges--instructing students in traditional Chinese brush painting, ikebana (Japanese-style flower arranging), and origami (paper folding). The New York Museum in Albany named Maihwa the Woman of Art in 1980. In 1996, Maihwa and her husband moved to Portland, Oregon, where she still resides. She teaches Chinese brush painting at different locations for Portland Parks and Recreation. Maihwa volunteers as a docent for the Portland Japanese Garden, the Portland Art Museum and the Lan Su Chinese Garden. Maihwa is a member of the Women in the Arts Museum in Washington, DC, the Oregon Watercolor Society and the Northwest Watercolor Society. Maihwa's paintings are collected by banks, hospitals and individuals. SUZHOU, CHINA October 2013 The Suzhou Foreign Affairs Office hosted the Portland Mayoral Delegation Visit of 20 participants representing education, culture and trade in Suzhou October 26 to 30. Visits were arranged with the Port of Taicang, Mayor of Taicang, the Nike Distribution Center, Shanghai/Suzhou American Chamber of Commerce, the Suzhou Singapore Industrial Park, Mayor and Vice Mayor of Suzhou, the China Energy and Environmental Protection Agency, the Suzhou Municipal Education Bureau, the Suzhou Garden Development Company and Suzhou Design Institute Company, the Suzhou Daily Group, the Suzhou Foreign Affairs Office and a performance of Romeo and Juliet by the Suzhou Ballet Theatre. The Suzhou Daily Group hosted PSSCA’s 25th Anniversary Trails of Bliss poetry and photography exhibit at the wonderful Tongli International Cultural Exchange Center. Portland-Suzhou Sister City Association celebrated its 25th Anniversary Evening Under The Stars Gala at the Lan Su Chinese Garden Wednesday evening August 21, 2013. 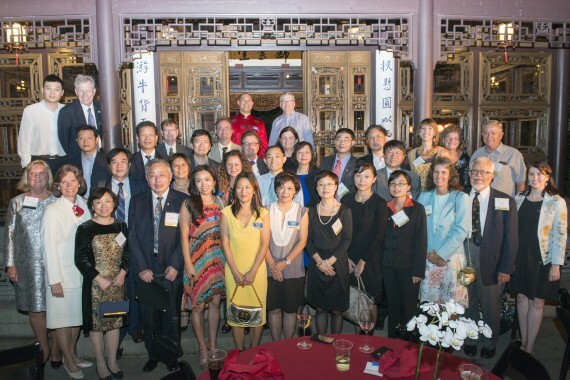 Twenty delegates, performers and artisans traveled from Suzhou China to attend PSSCA’s 25th Anniversary Gala. Commissioner Amanda Fritz represented Portland City Hall and welcomed the delegation from Suzhou on this very special, celebratory occasion. For the very first time in Portland, a sampling of the world renowned Suzhou Peony Opera, dating back to the Ming Dynasty was performed in the beautiful costumed tradition of the Kunqu Opera. Demonstrations of Suzhou silk embroidery and calligraphy were on hand as well as a “City Dreamscape” Exhibition at City Hall. The Gala would not be complete without a Chinese Dragon and Lion Dance. Gate to the Garden and Gala opened at 6:30 pm at the same time the Silent Auction opened. Traditional Chinese music from the boat house and service from the wine bar was also provided, followed by a sumptuous buffet at 7 pm, and entertainment and program from 7:30 pm to 9 pm.